When a mysterious alien crashes near Coast City, Hal Jordan existence is turned upside down. Chosen by a mysterious Power Ring, which grants the ability to turn thoughts into reality, he becomes part of an intergalactic peacekeeping force known as the Green Lantern Corps. Using only his willpower, Hal Jordan must protect the Earth and defeat an ancient and fearful enemy that threatens both mankind and the Corps. To win, Hal must over come great fear and prove his worth as a Green Lantern. The Green Lantern universe is a vast, rich and fascinating place. Unfortunately, the original movie only hints as those intriguing possibilities while it plagues the viewer with a hero who refuses to take up the mantle of the Green Lantern and an incoherent villain. My intention is to streamline the movie by removing most of the bad dialogue, silly reactions shots and subplots. I have reordered some scenes for a more logical and cohesive storyline, keeping only scenes that progress the plot or develop the characters. By doing so, I hope to transform Hal Jordan into the hero he was meant to be -- the GREATEAT GREEN LANTERN IN THE UNIVERSE! A very special thanks to BionicBob for his priceless and greatly appreciated inputs and support, including his incredible art! • Removed scenes or parts of scenes that were not progressing the storyline or the characters. • Edited all scenes about Hal refusing to take the mantle of the Green Lantern or telling is not worthy of it. • Hal feels doubt and fear (a main theme of the movie) about is new role but accepts and embraces it. • Edited all scenes about Hector since his acting is sadly inconsistent, erratic and all over the place. • Hector is now a more serious character and surrender to the power of fear, until Parallax arrival that is. • Reordered a couple of scenes for a more logical and cohesive storyline. • A LOT of small cuts to remove cliché and bad dialogues and reaction shots. •Added a new and intense music during the Warner Bros and DC credits. 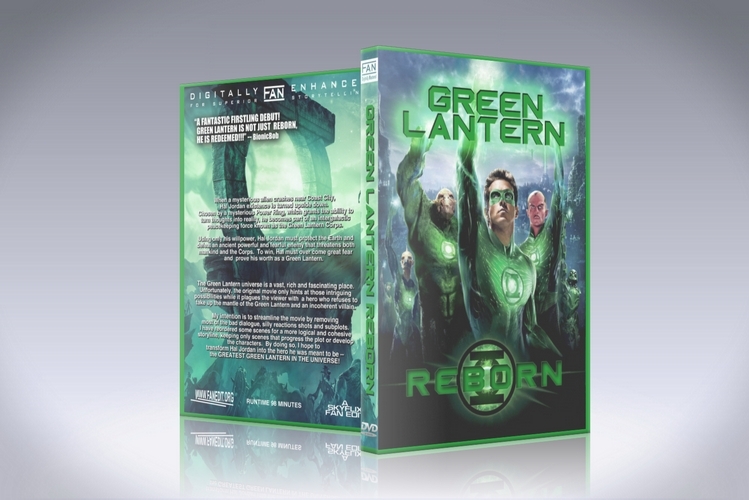 •The movie doesn't start with the Green Lantern universe exposition, the viewers will discover this when Hal does. •It rather opens more mysteriously with the alien crash and Parallax waking up with a new and more ominous music. •Following Parallax escape, switched directly to the Hal and Carol dogfight with an added title card "PLANET EARTH: SECTOR 2814". •Therefore, removed the unnecessary Hal introduction scene, Carol introduction scene and dogfight exposition scene. •During Hal crash, removed all 1993 flashbacks and replaced them with new quick flashbacks. •Following Hal crash, removed the random ranting about Carol and the Ryan Reynolds type reaction. •After Hal is left alone, switched to the 1993 flashback with young Hal unable to sleep with an updated 1993 title card. •I kept this flashback because the death of Hal father has defined his personality. •Removed the scene between his father and mother talking to keep the focus on young Hal and his father. •After waking up, removed the scene of young Hal running outside and toward the airfield and switched directly to the airfield. •I kept the scene between young Hal, Carol and Hector because it's the only scene establishing a previous relationship. •Removed the ironically easy quote of Hector about alien life on other planets. •After young Hal watches his father plane crash and burn, switched back to present day with Abin Sur attacked by Parallax. •Following Abin Sur launching to earth, switched to Hal arriving at his nephew birthday party. •I kept this event because we have to establish where Hal is when captured by the ring power but it's been shortened. •After Hal ears the news about his crash, switched directly to Abin Sur crashed. •After the ring power starts searching for a replacement, switched directly to Hal entering his nephew room. •Removed Hal speech about reassuring his nephew therefore going directly to Hal giving his father airplane model. •After Hal and friend leaves Abin Sur corpse and ship, removed their driving escape and discussion. •During the scene where Sinestro announces the death of Abin Sur to the Guardians, added a title card "PLANET OA: SECTOR 0000". •Removed the cliché Hector introduction scene, switching to Hector dropping his glasses on the desk. •From this point on, removed all cliché and bad dialogues and reaction shots from Hector. •Removed the cliché concept about alternating scenes between good and evil rising up. •Now, the scene of Hal reciting the oath is uninterrupted with a couple of cuts to tighten the scene. •Removed the scene of Hal being afraid of the lantern. •After Hal finalizes his oath and opens the door to Carol, switched directly to Hector inspecting Abin Sur corpse. •Now, the scene of Hector being infected by Parallax wound is uninterrupted with a couple of cuts to tighten the scene. •Added a new and more dangerous music during Hector analysis of the corpse. •The scene ends more ominously, slowing down during Hector infection and him getting down and giving his data to Amanda. •Again, removed the cliché concept about alternating scenes between good and evil rising up. •Removed all scenes about Hector having a bad night, therefore the scene of Hal flying to Oa is uninterrupted. •During Hal examination, added a new scene showing a part of the indoctrination process when zooming on the ring. •Added beautiful space shots, Hal mind flying through space, earring his own heartbeat. •We then see the original Green Lantern exposition scene, explaining to Hal and the viewers what are the Green Lanterns. •When the Green Lantern symbol is displayed in space, switched to the symbol on Hal new suit. •During the Tomar-Re introduction scene, removed all questions from Hal. •Hal's supposed to known a lot of those things from the indoctrination process, Tomar-Re explains them for the viewers. •After Tomar-Re invitation to fly, Hal successfully and proudly flies at first try. •After flying above the central battery, switched to Tomar-Re, Kilowog and Sinestro training Hal. •It never made sense to me seeing Sinestro announcing an assault against Parallax and afterward taking time to train Hal. •Removed Hal being really afraid and telling them the ring made a mistake choosing him. •After Sinestro wins against Hal, switched to Hal and Tomar-Re going to Sinestro speech. •During their travel to this speech, added a new and more dramatic music about Hal contemplating the difficulty of his role. •After the Green Lanterns brighten their ring, switched to Hal returning to earth. •Removed Hal removing his ring, he simply reflects on being a Green Lantern. •Shortened the class introduction scene and removed the cliché Class dismissed dialogue before Hector leaves his class. •Removed Hector message from his father and the subsequent scene, I like Tim Robbins but he's really bad in this movie. •Removed the part where Sinestro tells the Guardians they must forge a yellow ring. •Shortened the party introduction scene, starting with Hal grabbing a glass. •Removed the scene between Hector and Carol, and subsequent scene between Hector and his father. •Removed Hector father saluting the crowd, going to Hector crashing the helicopter. •Removed the helicopter going toward Carol father, it should have cut this head off. •Removed Carol reaction shot of Hal flying away after the rescue. •Removed Hal waking up, switching directly to his friend knocking on the door. •Removed Hal failing to use the ring, switching directly to him charging the ring and suiting up. •Removed part of Hal reaction shot with his costume. •Removed Hal telling Carol he left the Green Lanterns and subsequent scene from Carol reacting to this. •Removed Hector waiting in his car and seeing Hal flying away. •Removed the cliché I don't know what you're talking about. •Removed the We know everything son dialog, going to a more surprise reaction from Hector. •Removed Hal remembering Tomar-Re telling him The ring never makes mistake, going straight to the ring alarm. •Removed Hector reading Hal mind about Carol reaction to Hal quitting the Green Lanterns. •Removed Hector shouting for nothing and then disappearing. •Removed the scene between Hal, Carol and his friend about yet again Hal telling is afraid and unworthy. •Removed the scene where Parallax tells Hector to eliminate Hal. •Removed everything about the completion of the yellow ring and using it against Parallax. •Removed Hal telling not to risk anymore lives and asking permission to fight for earth, that makes no sense to me. •Removed Hector feeling sorry for himself being jealous of Hal. •Removed Hal tricking Hector and his subsequent stupid reactions. •Removed Hector being able to use the ring to punch a hole in the wall. •Removed the I lied repartee between Hector and Hal. •Removed Parallax telling Hector he failed him. •Shortened the discussion between Carol and Hector before the final fight. •Changed the reused shot of Sinestro lifting his arm in the air with a shot of the Guardians watching from their citadel. •Changed the really bad flying to space music with a new and way better music from one of the trailers. •Changed the first part of the end credits music with a new and way better music from one of the trailers. •Removed the middle scene of the end credits where Sinestro puts the yellow ring. Congratulations!! Massive improvement upon the original film. Honestly surprising, almost feels like a different movie. You know what you are doing. The minor problems I had were related to dialogue sound quality and noticeably bad CGI. The CGI is obviously not your fault though. Great Job! Now this is a huge improvement on the original comercial release, SKYflix delivers a trimmed down, straight to the point GL movie that almost meets my expectations for one of my favorite comic book characters. Thankfully all the dumbest and mopey Hal Jordan moments are gone, and while its unfortunate that its imposible to replace Ryan Reynolds with a better actor; his trademark "look at how a funny guy I am" moments are trimmed to a bare minimum. The plot remains the same, not really in line with either the real GL origin or the Parallax arc; yet it is much more enjoyable with all the unnecessary and repetitive exposition. I have to say I missed the final scene in which Sinestro forges his yellow ring. Video and audio editing is seamless, sadly we have yet another 2.0 audio track; therefore points are deducted from A/V quality. It was SO good me and my family are watching it for movie night. I don't remember much from the original movie, besides getting a little bored and a lot of stuff was weird. But when I watched this cut, it made me shocked. It was one of the best superhero movies I've seen. This cut is my real Green Lantern movie, and I will never remember the original one. 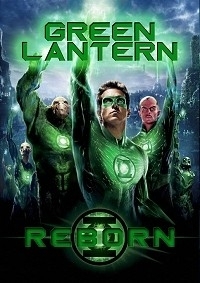 I think that we all agree that the original movie is really bad, the character isn't brought to life like it should and the most sad thing is they didn't exploit the Green Lantern Corps, but those are some other topics for another time, the truth is that this edit is really really good, it takes a bad movie and makes it enjoyable, it cant do miracles to the character and wat we all expected form this movie but in a narrative sense it does make a miracle, it makes the Green Lantern movie enjoyable. The transitions are really good, I really enjoyed that it trimmed the repetitions of the dead father (kudos on this). The overall quality is very good, congratulations on making this enjoyable. In short - this edit rocked! This is so much a better version of the original and I thank SKYflix for it. I think some of the other reviews are a little too critical of what is only a comic book superhero character turned into a live action movie - it's not Gone With The Wind but this edit achieves everything I expect from a fun and action filled movie of this genre. I have to admit, I did make a personal copy of this edit for myself with a slight variation, but I never would have been able to do that without this masterful edit. If you're a DC universe fan you will love it, and I highly recommend this edit to resurrect what is a worthy character to the franchise. But if you're not a fan then don't watch it - quite simple really!